Java™ 7 util.concurrent API UML class diagram examples - executors, concurrent collections, and futures. 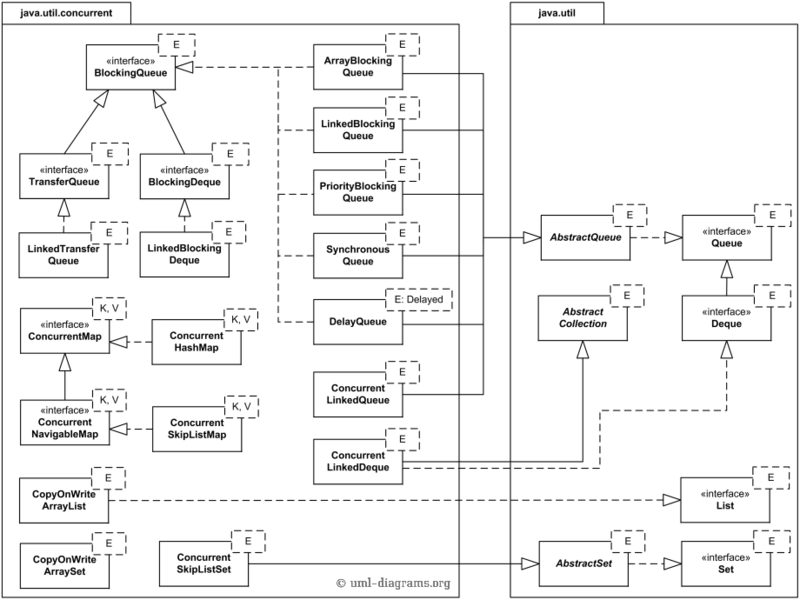 Here we provide several UML class diagrams for the Java™ 7 java.util.concurrent package. Several java.util.concurrent. * packages introduced with version 5.0 of the Java platform added high-level concurrency features to the Java and new concurrent data structures to the Java Collections Framework. 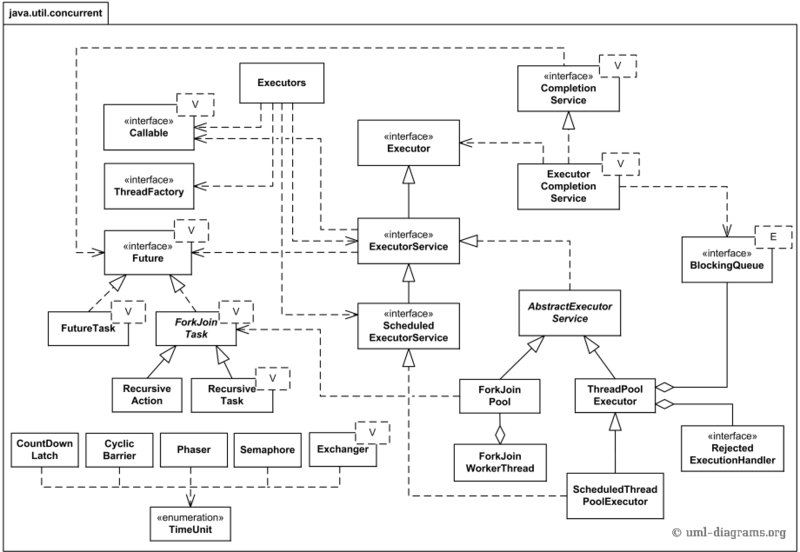 UML class diagram for the Java™ 7 executors and thread pool managers from the java.util.concurrent package. Executors define a high-level API for launching and managing threads to support large-scale applications mostly by adding thread pool management abilities. The java.util.concurrent package includes several thread pool management implementation classes. UML class diagram for concurrent collections from the Java 7 java.util.concurrent package. Concurrent collections are also part of the java.util.concurrent package. These collections reduce the need for synchronization and designed to support concurrent access and modifications of the large collections of data. UML class diagram for asynchronous results (futures) from the Java 7 java.util.concurrent package. The Future<V> interface represents the result of an asynchronous computation, where type V is the result type returned by the Future's get method. Methods of this interface allow to wait for the computation to complete, to cancel execution of the task, to check if the computation is complete or was cancelled, and to retrieve the result of the computation. The Delayed interface allows to mark objects that should be acted upon after a given delay. ScheduledFuture<V> interface extends both Future<V> and Delayed, and is usually a result of scheduling a task with a ScheduledExecutorService. The FutureTask class is an implementation of Future that implements java.lang.Runnable as required by RunnableFeature interface, and thus may be executed by an Executor.